We live in a world of excessive mass production, where consumer culture is driven by outsourced labour and cookie-cutter items, then branded as “glamour”. Just about anything we own is one of many replicas. Often, even items that are meant to be very personal such as jewelry, clothes, and decorations for the home come from a factory, and lack the essence of human craftsmanship. When something has served its purpose, we tend to abandon it, throw it out, or just forget about it entirely. In this post, we’re taking a look at artists whose work contradicts this culture of mass production. These creative thinkers draw inspiration from items that are considered to have outlived their usefulness, and breathe new life into them, transforming “junk” into treasure. We’re talking about assemblage, otherwise known as found object art. The idea of re-appropriating used materials is not a new concept, and the status of assemblage as an art form dates back to the beginning of the twentieth century. 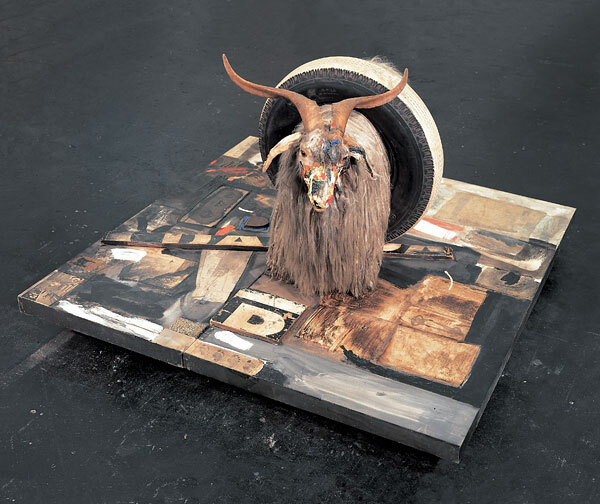 Pablo Picasso worked with found objects throughout his career, and years later Robert Rauschenberg made assemblage his niche. This art form, although far from new, is trendier and more relevant in our times than ever before. No longer an avant-garde art form reserved exclusively for galleries, assemblage has entered the world of fashion. There is something fascinating about owning and wearing an item, like a broach or necklace, which has been welded together from antiquated objects that are steeped in history to begin with, and have been reinvented to tell a brand new story. In a successful work, discarded pieces of “junk” are enshrined, redefined, and imbued with a sense of beauty that had been lost or disregarded. Assemblage takes many different forms: sculptural, collage, and often jewelry. Another interesting and popular approach is converting books into artworks, a creative exercise which anybody can undertake. The above necklaces, created by Aminda Wood, are composed entirely of cast-off objects. These whimsical jewelry pieces act as relics from treasure-hunting journeys undertaken by the artist in search of their unique components. They invite speculation upon the roles these objects played in their past lives, before their re-integration into the dainty, ornate work before our eyes. 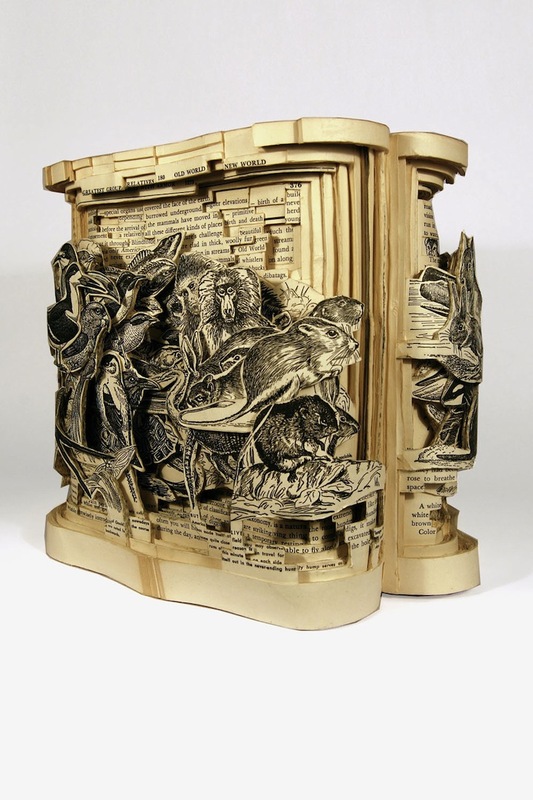 Artist Brian Dettmer uses surgical tools to turn books into incredibly intricate sculptures. His subjects include outdated encyclopedias, illustration books, medical journals, and even dictionaries. He does not implant any new content, but rather strategically removes sections to depict the essence of the literature in new and fascinating ways. 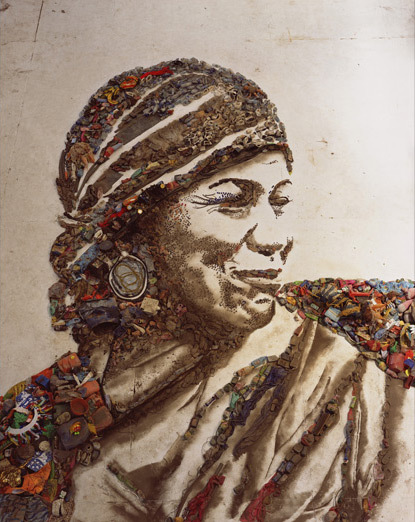 Vik Muniz creates assemblage pieces writ large, and composed entirely out of garbage. These pieces were featured in a fabulous film entitled Waste Land (which we highly recommend!) The documentary examines an extensive project of Muniz’s, which aimed at fostering a new and exciting sense of purpose in a community that exists within one of the world’s largest garbage dumps. These artists have inspired us to reconsider what we see as junk, and to remember that even the most unlikely items are bursting with the potential for beauty!